There are a lot of dude ranches in Wyoming. I counted over 20 and there is probably more. Some are adult only. Most of them listed they are available for corporate meetings, weddings, and family reunions and such things as well as individual and family guests. This ranch’s contact information is PO Box 95 Old Ranch Road, Moose, Wyoming 83012. Their phone is (307) 733-3435. They are between the Grand Teton National Park and Bridge-Teton National Park. I’ve been to this area, but I was pretty little and don’t recall any of it. I only know I was there because I’m in pictures when my family was visiting. The Grand Tetons are such a majestic mountain range standing watch. I can’t imagine a more beautiful spot to ride a horse through. Some of the things to do at this ranch include a spa service that offers massages and mineral baths. There’s an aerobic class too. Along with great dining and western hospitality staying at this ranch ensures each guest enjoys their stay. They have more than 90 horses and help each guest to pick the right mount so they will have a wonderful riding experience. They provide some learning that is needed so that you and the horse chosen will have fun. Their rides include an all day excursion, herd cows, family’s riding together, even fast rides and half day rides. So there’s a variety to choose from. May 31 to June 7 and August 30 to September 13 with a 3 night minimum stay in the Living Room Cabin with 1-4 guests for a week is $12,600. Add a guest and it will be another $700. per guest per week. The Half Duplex Cabin with 1 to 2 guests runs a $5,250. per week and additional guests will pay $700. per guest per week. The King Suite with 1 to 2 guest is $5,250. per cabin per week. Children under age six stay for free. During the June 8 to August 29 spot the Living Room Cabin with 1 to 4 guests is $13,500. per cabin per week. The Half Duplex Cabin with 1 to 2 guests runs $6,300. per cabin per week. Additional guests in either of these cabins will pay $700. per guest per week. King Suite for 1 to 2 guests is $6,300. per cabin per week. Again children under six can stay for free. There is an Adult Only time from August 30 to September 6. Call for details on this one at (307) 733-3435. This ranch is also in the Jackson Hole are. Contact information is 12355 US 191 Jackson, Wyoming 83001. The phone number is (307) 733-2097 or (800) 528-2084. The Hoback River winds through and meanders on it’s way providing floating on the river and fishing. In the main lodge there is saloon with a pool table. Some activities besides the horse rides, are hikes, and overnight camp outs. During the months of June, July, and August the rates are one person per week $2,650., two per person per week is $2,440., three per person per week $2,185., and four per person per week $1,950. Children six and older are the same prices. For the months of May, September and October, the costs are one person for three nights $1,350., four nights $1,800., five nights $2,200., six nights $2,450. and seven nights $2,650. For two people per person for three nights $1,265., four nights $1,685., five nights $2,105., six nights $2,275., and seven nights $2,440. Three people per person can stay three nights for $1,095., four nights $1,450., five nights $1,820., six nights $2,000., and seven nights $2,185. The rate for four people per person for three nights is $950., four nights $1,300., five nights $1,560., six nights $1,760., and seven nights for $1,950. Children 4 to 5 are 50% off and children under 1 to 3 can stay for free. The ranch contact information is PO Box 243, Lander, WY 82520. Phone number is (307) 332-2995. They are in the Wind River Mountain Range. This is Wyoming’s highest ranch in the mountains. They offer trail rides in the mountains and pack trips. Also fly fishing and hunting can be part of the package; all in the Shoshone National Forest. Every night the guests can watch as some 70 horses race out to graze in the mountain meadow with no fences. Their rates are per person. For three nights adults can stay for $850., kids 6-14, $650. For four nights adults are $1,050. and kids 6-14 stay for $850. Five nights for adults is $1,250. and kids 6-14 is $950. and for six nights adults rate is $1,400. while kids 6-14 are $1,000. This ranch is also near the Grand Tetons and Jackson Hole area. Their contact information is PO Box 308, Teton Village, WY 83025. The phone number is (307) 733-2655. They keep bicycle paths clean if you’d rather ride a bike then a horse. This would not be me. Much better to be on a horse, in my opinion anyway. A rodeo is put on, but it’s off the ranch. If you like to float down the Snake River that can be arranged. Other water sports such as water skiing, swimming, and a boat tour is part of the agenda. Of course there is the horses to ride either all day, half day and the cattle drives. This is where I’d probably be. 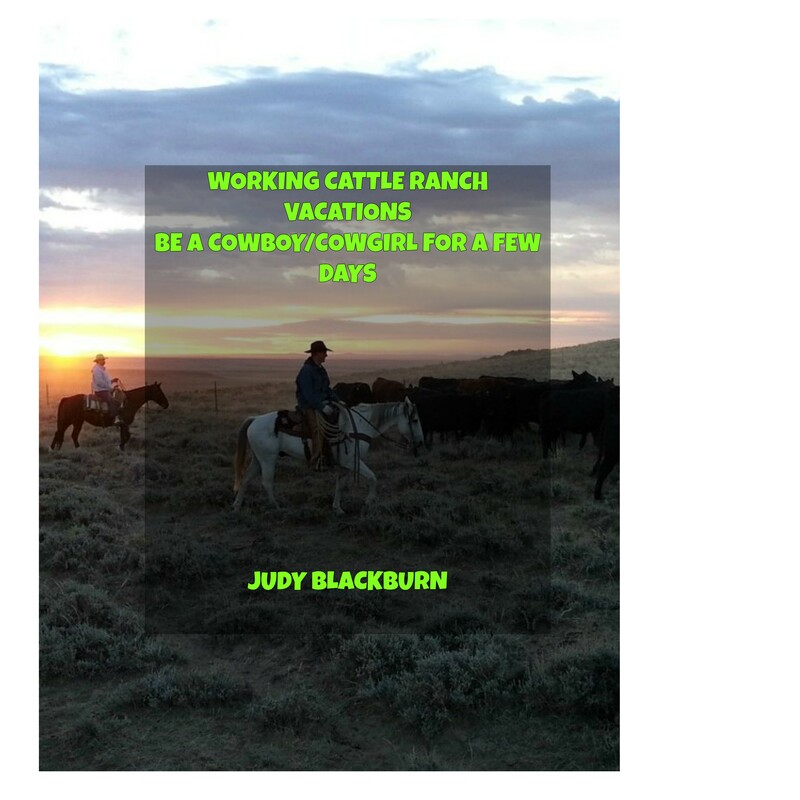 To stay at this guest ranch in June 14 to September 27 the 2015 rates are per person per week. They have several cabins starting with Teewinot Cabin, Rendezvous Cabin, and Spruce Cabin all for the same cost of $2,317. The Teton Cabin is one rate of $2,226. Meadows East and Meadows West Cabins as well as Coyote East and Coyote West Cabins are all $2,226. The Wren and Willows Cabins are $2,065. The Cottonwood and Sage Cabins are $1,813. The last cabin is called Paintbrush and is $1,666. This ranch reminded me of Medicine Bow, the town in the Virginian TV series, but I don’t think there is any connection, couldn’t find one anyway. The ranch is found in the Snowy Range of the Rocky Mountains and close to the town of Saratoga. The land in actually the Medicine Bow National Forest. Contact information is Medicine Bow Lodge, Star Rt. 8A, Saratoga, WY 82331. Phone number is (800) 409-5439 or (307) 326-5439. They have a long list of activities available to participate in and seems they cover a wide range of interest. Along with horseback riding there is the fishing and hunting. At this ranch there is rock collecting, learning how to track animals, and looking at the stars. That’s not all there is, but this gives an idea of some of there fun things to do. Pricing for 2015 summer June 14 to August 30 come in a daily price and weekly. For adults daily it is $260. and weekly is $1,500. Young adults (13 – 21) daily is $210. and weekly is $1,140. Kids (6 – 12) daily is $175. and weekly $930. The little ones five years and younger can stay for free. They have a spring rate the runs May 13 to June 13. For adults daily $210. and weekly $1,140. Young adult (13 – 21) daily $165. and weekly $930. Kids (6 – 12) daily is $150. weekly is $840. Again the little ones five and under can stay free. The Winter pricing is November 1 to March 31. Adults daily rate is $120. weekly $660. Young adults (13 – 21) daily is $80 weekly is $480. Kids (6 – 12) $70. daily and weekly $420. Kids five and under are free. If you are a hunter call for price and schedule of hunts. In Cody there is the Cross Sabres Ranch which is one of the oldest ranches in Wyoming. It was started in 1898. Sounds like there is a lot of history to learn about. Horseback lessons are a place to start with the horse chosen for you if you have not ridden a lot. There are short rides or all day with a packed lunch included. This ranch like many others has not only the horse riding, but also fishing or rafting in the Shoshone River. The kids can participate in a program geared just for them. They are riding, learning about horses and the area and can enjoy games and archery as well. In the town of Cody you can have fun at the rodeo and sit on a real bull if desired. You might even get to watch an old west gun fight. To stay at Crossed Sabres the pricing for adults for six nights is $2,000., five nights $1,670., four nights $1,336., and three nights $1,005. Kids (6 – 12) for six nights $1,500., five nights $1,250., four nights $1,000. and three nights $750. Children (3 – 5) $400. Under three years of age are free. Thanks for stopping by my hitching post. Please leave a comment or ask a question. I’ll do my best to answer.